We look at the statistics behind the midweek Scottish Premiership clash between Aberdeen and Rangers at Pittodrie Stadium. The match will be live on FOX Sports 1 from 21h40 CAT on Wednesday 6 February 2019. Stats relevant only to the Scottish Premiership (no other competitions included, unless otherwise stated) and accurate as of 4 February 2019. 46 – The points haul of Aberdeen after round 24. They have averaged 1.9 points per game in 2018/19. 48 – The points haul of Rangers after round 24. They have averaged 2 points per game in 2018/19. 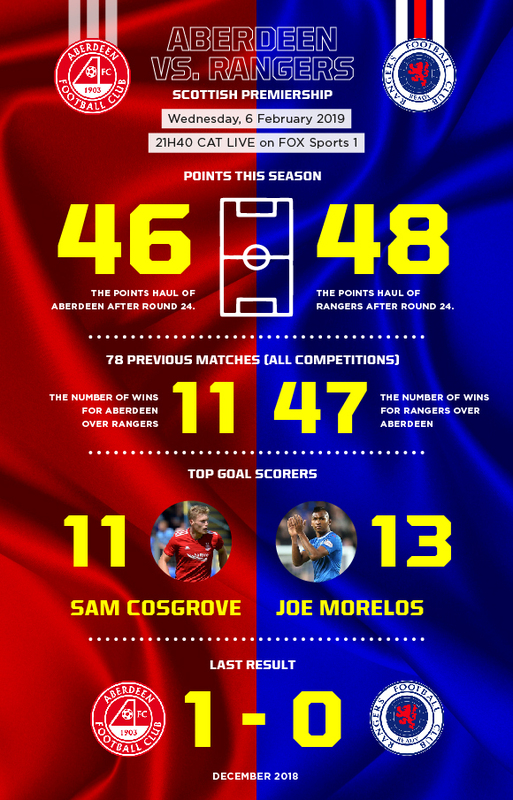 58.3 – The win percentage of both Aberdeen and Rangers this season, with 14 victories from 24 matches. 4 – Rangers have suffered four defeats this season, compared to six for Aberdeen. 20 – The number of draws between the teams in the sequence. 9 – Aberdeen have won 9 of their 40 home matches against Rangers, a 22.5 percent success rate. 1-0 – The score by which Aberdeen defeated Rangers in the teams’ most recent meeting, a Premiership clash in December 2018. 13 – The number of goals scored by Alfred Joe Morelos, who is Rangers’ leading scorer so far this season. 11 – The number of goals scored by Sam Cosgrove, who is Aberdeen’s leading scorer so far this season. 22,199 – The seating capacity of Pittodrie Stadium, which will host the match.